A fairly entertaining novel, although it didn’t keep me enthralled. I couldn’t decide if ultimately, the whole spy organisation was believable or not; some aspects felt far-fetched, where I had expected something more on the… ‘realistic’ side? Not that I know much about actual MI6 operations are conducted, that is: it was more a feeling than anything truly objective. Some parts I found amusing and inventive, in a sort of parodic way that I could only envision in a novel or a game (such as conducting interrogations in disused Tube parts, so that nobody would hear the cries over the din of trains or wonder about ‘that drunk, stumbling friend I’m dragging with me at 1 am is absolutely not a suspect I’ve just finished torturing’). I’d say this works if you’re looking for the kind of caricatural spy network, and works probably less well otherwise. As far as I’m concerned, I’m on the fence with it. As a result, the plot was a little unconvincing, and I couldn’t really connect with Lex as a character: I liked her snarky comments in general, but found it difficult to reconcile her callous take on offing and torturing people with the double standard of ‘I do it on a regular basis to other people, but no one dare touch my daughter’. While wanting to protect one’s family is totally normal, there’s an underlying hypocrisy here that doesn’t sit too well with me, probably because I usually have a strong reaction to ‘do what I say, not as I do’ people. On the other hand, the novel raises interesting, if not unexpected points about age-old attitudes in the workplace regarding women, and especially mothers. 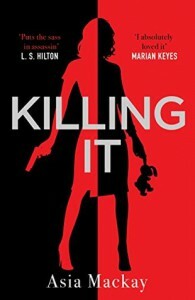 In that, ‘Killing It’ is close to a lot of things we can still see nowadays, where in spit of feminist progress and workplaces generally opening up, a woman’s position is still subjected to ‘having to prove herself twice as much as the men’. (There’s been a lot of progress IRL, and I sure won’t deny this, but I’ve been in enough interviews with barely concealed sexist questions to know that the way to full equality is still long.) Basically, Lex’s struggle with coming back to work after her maternity leave felt real and relevant: some of her colleagues, and especially her boss, kept on questioning her ability to do her job and not ‘giving in to hormones’ and all manners of crap arguments. Here, too, some things were caricatural and laid out too heavily (like Bennie’s attempts at putting Lex down)—and, of course, Lex’s job is not just any office job, and is much more dangerous—but it doesn’t change the fact that many people (other women included) still assume too often that as soon as one becomes a mother, one becomes ‘weaker/less smart/less able/whatever’ and have to prove herself all over again… while nobody bats an eyelid at a man becoming a father. Conclusion: The humour didn’t always work for me, and some things were definitely hammered in too much. Still, as a light novel that doesn’t demand too much focus, it worked.